I know that feeling exactly. I have a hobby product on Tindie and have thought about it a lot and want to update it but have no motivation. I’ve also had long spurts where I don’t want to do any hobby electronics at home (my day job is EE). Eventually my desire to play with circuits comes back and I start something new. I wouldn’t force finishing the project. Your happiness is worth more than this project is to anyone out there. If you decide you don’t want to finish it, it would be nice to open source your efforts so maybe others can. In my experience, it’s not going to hurt your sales if you do come back and try to finish it someday (unless someone tries hard to make a business out of your product – but you can add a license to disallow that). Any chance it will support 1.4MB high density Superdrives? The Apple II 3.5 Controller is ridiculously rare and expensive. The CFFA3000 has the ability to update its FPGA, but it already has an obvious storage location for the firmware files. In theory it could clone the Apple 3.5 Superdrive controller, yes. It would be difficult though. I believe that card has an on-board 6502, so a soft-6502 would be needed in the FPGA. So far I’ve only looked at the Liron clone configuration in detail. CFFA3000 is more similar to the Floppy Emu: both combine an Atmel microcontroller and a small Xilinx CPLD with a slot for modern SD card / CF card / USB storage. The Yellowstone card described here is quite different, and is a controller card for a real external disk drive. It doesn’t have any microcontroller or modern storage media connectors. The hardware design is much simpler, and it should cost less (assuming reasonable sales volume for economies of scale). Maybe your JTAG issue is caused by a ground loop. Have you tried programming it with a laptop on battery? Any chanch you could have these ready for KFEST? If you do, I want to buy one. If you’ve got storage space for disk images it might be neat to have a way to directly read/cache a real disk into there and a mechanism to swap between real and virtual disks. That way if you like real disks, but have limited patience you can minimize swaps. When you want to use a program you could load the program in and then just swap once to a data disk. Might also conveniently allow you to use 1 drive like 2 or 2 drives like 4. Is there any limit on the number of drives it can present. I thought regular controllers could only handle 2 drives per card? I second Ferdinand Keil’s comment. 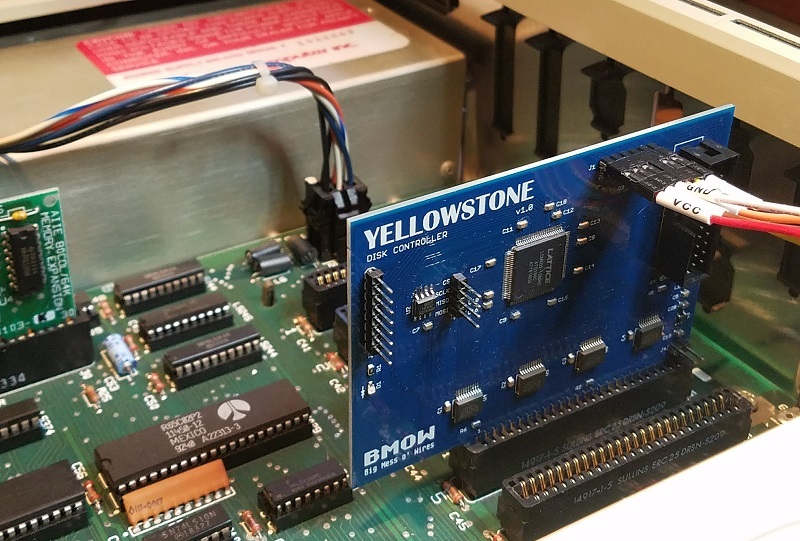 With Yellowstone installed in the Apple IIe and the JTAG wires disconnected, what potential do you measure between the Apple IIe and JTAG grounds with everything powered on? I’ve run into a few odd grounding issues like this myself. You may need to the a USB isolator (http://www.linear.com/solutions/5123). Also, I am assuming JTAG VCC is an input to the HW-USBN-2A. Looks like it is on the HW-USBN-2B. Thanks for the suggestion. It could be a ground loop, but I’m a little bit skeptical. The Apple II and the PC with the JTAG programmer are both connected to the same wall outlet. I’ve had no problems using the same Apple II and PC with an AVR programmer for a Floppy Emu powered from the Apple II. But I will measure it to be sure. Yes, the VCC is an input to the JTAG programmer, it uses it to sense when there’s a device connected and to determine what voltage level to use for JTAG I/O. Placing the IIe on an isolation transformer would be a good data point to rule this out or not. I’ve also seen people float or remove safety ground pin all together, but I cannot condone that as a permanent solution. This project is great! The possibility to add a Liron or a 3.5 floppy controller to an Apple II is something I’ve been wanting for a long time. I hope you find the motivation to finish it. Thanks again for supporting the Apple II community. This sounds fantastic! I have one FloppyEmu and considering buying another – flashing between my Apple //e and Mac Plus takes the fun out of it. This would seal the deal and I hope there’s a bundle to buy the card and an Emu. Best of luck solving your issues and if released I’m a buyer for sure! I would definitely buy one if you make them, and I actually have a LIRON card. It seems like the perfect companion for my FloppyEmu, which I love, BTW. I understand about finding time and motivation for hardware projects for retrocomputing. I also dabble in it a bit and I have several projects that are in various stages of completion that I need to finish up one of these days. I’m really more of a software guy, and you are way ahead of me as far as building hardware goes. I have a basic understanding of how to design stuff for Apple II, Arduino, etc., using basic TTL and CMOS devices. I’m currently learning how to lay out PCBs with modern software to get them fabbed. Once I get that down I will start learning how to create GALs as I already have a programmer that will do that (Minipro TL866CS). After that I want to get an FPGA dev kit and learn Verilog and/or VHDL. I’ve been looking at the Altera Cyclone IV or maybe the Xilinx Spartan 6. I’m leaning towards the Altera as it is less expensive and has a reputation of the software being easier for beginners. What a great board and excellent idea, I know you talked about it not being fun and I hope this changes for you, I want you to know that you have made some amazing things that make it so people like myself get to relive our childhood enjoyment of these machine with a low cost and ease use. So be proud that made excellent things that have brought 100s of people great joy. I will buy one of your cards in a second, I agree with Chris M. in the comment support for High Density would be amazing. In my case it’s an AE HD+. If you get to implement the CFFA style image storage please talk to John Morris and make it so that it will support the new format that he is working on .WOZ. I hope you find the happiness and motivation that you look for in this project and any others in live that bring you happiness. I’m wondering if you’ve ever had any thoughts about tackling the world of IIGS CPU accelerators? Steve, I hope you find the motivation to finish this amazing project and the enjoyment of knowing how much you’ve helped the Apple II community already with your floppy emu and other gizmos. I know that you know how much everyone would love to see an alternative to the super rare and expensive Liron controller and to have support for other drives and all the other features you mentioned. Wow! I’d buy this card in a heartbeat. Thanks for all your efforts to help keep our hobby alive. I like the idea of multiple firmwares that are switch (or software switch) selectable. For instance, what’s sorely lacking in slotted Apple-II machines is a Smartport – something that you could plug an Apple 3.5, Unidisk 3.5 or other mass storage device into. The IIc and IIc+ have a smartport that’s awesome, but not the II+ and //e. If I were to give my vote, it would be for a Disk-II / Liron / Universal Drive Controller (a-la Vtech’s) that could run any common physical disk drive. Plus added functionality for mass storage via SD-card or CF card volume images. I’m sure I’ll make more progress on the prototype, hopefully soon. I’m less sure about turning it into a finished product, but we’ll see. As I mentioned above, my biggest concern is the lack of any simple way to update the firmware on the card. So it would either be non-upgradable (and pray there are no bugs in the 1st revision firmware), or would need extra microcontroller and SD hardware solely for firmware updates (increasing complexity and cost). I have no problem with it requiring an extra programmer tool to update. 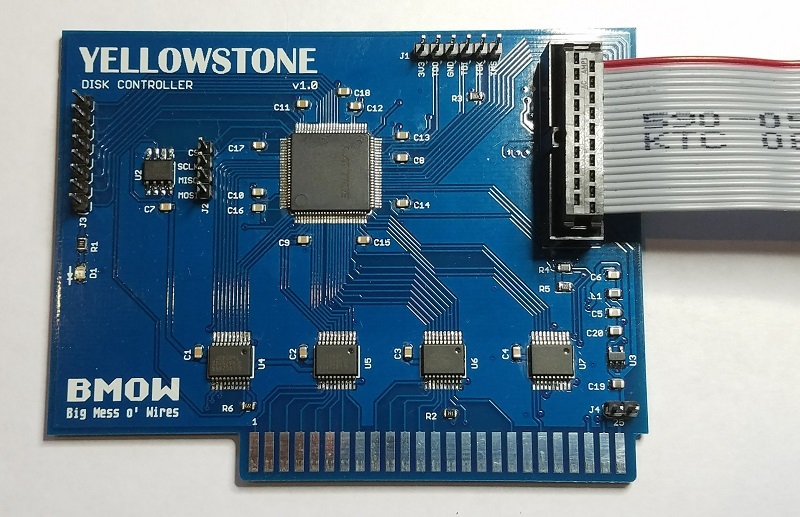 I have a JTAG tool and a Minipro TL866CS which I can update to add an ICSP port and I’m thinking of buying an Altera Cyclone IV dev kit which includes a USB blaster… If I had to buy another tool it wouldn’t be the end of the world either. It would be a shame given the scarcity of LIRON and UDC cards at least if this wasn’t released. Even if the only functionality was to act as a replacement for those it would be worth it. And if it can do more all the better. As I said before, this looks like pretty much the perfect complement to the FloppyEmu. If you make it I for sure will buy at least one, and I already have both a LIRON and a UDC. 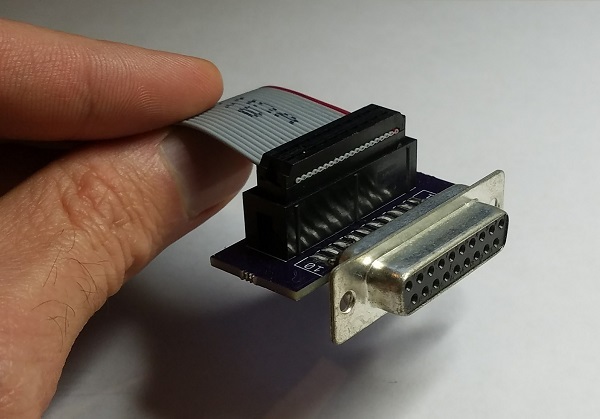 If you wanted to make things more interesting… I don’t know how much space and pins you have left on that FPGA… but I think there would also be a demand for a WD17xxx compatible controller to handle PC and/or CP/M style floppy drives with the 34 pin interface. Or another idea is 4 floppy ports like a Rana Systems controller… Probably of extremely limited utility these days, but I always liked those controllers (have one of those too). No possibility of uploading firmware via the Apple slot then? The firmware might be large enough that it would be hard to deal with on the Apple II side. Anything that won’t fit on a floppy may be difficult for some people to manipulate. I would guess that the image for an FPGA could be megabytes? Or am I way off? I would say the majority of people would not have any issues loading a file size larger that 1mb…. Floppy EMU……or maybe this would give them a hint to pick one up…. Firmware flashing from inside the Apple II is theoretically possible, but would involve some difficulties as described in the post. The card would need additional hardware to somehow multiplex the data bus and the JTAG interface. Then once the user downloaded new firmware from the web, how would he get it onto his Apple II? He’d need to own some *other* disk solution already, like a Floppy Emu or CFFA3000. Then where would he store it? It’s about 350KB now, and will probably grow over time, so it’s too big for a floppy. But if you could overcome all that, and the cost of the extra hardware on the card, then you could probably write JTAG player software for the Apple II that would perform the firmware update. 1. Add an extra microcontroller and USB interface, purely for firmware updates. 2. Keep the JTAG interface as the only avenue for firmware updates. The typical user wouldn’t be able to perform firmware updates, so the card would effectively be a fixed-function device (maybe with a switch to select a few different functions). I’d rather have the JTAG option than add a lot of extra complexity and price to the card. But that’s maybe just me. As I’ve said before I already have a JTAG programmer and if I needed to buy another programmer it wouldn’t be a big deal as long as it isn’t super expensive. I think any generic JTAG programmer would work, or maybe even something like a Bus Pirate. I haven’t tried any non-Lattice programmers yet though. The JTAG programmer I have is a very generic one sold for doing things like installing a bootloader on Arduinos. I think I paid under $10 for it. 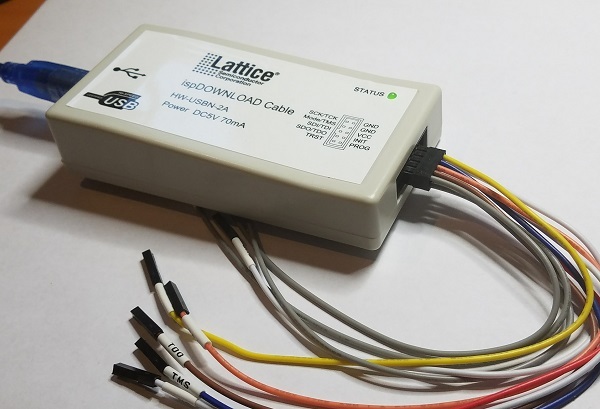 I don\’t know about the Lattice programmer, but the ones for Altera (USB Blaster) aren\’t very expensive, under $30. I just checked; the Lattice ones are around the same price range. Not out of line if I ever needed one and the one that I have didn\’t work for some reason. why not just make it universal and make it an apron? inthink more people would have this than the jtag.. I meant to say why not make it universal and make it eprom? methinks more people would have this burner than the jtag…. I don’t think that will work. I have an EPROM programmer (Minipro TL866CS), and I don’t think it is compatible with an FPGA. I suppose you could put an EEPROM on the board and load the FPGA from that somehow, but that is just adding more components and complexity and cost to things. You could still be having power problems even if the power supply is doing fine. The slot only has one pin for each voltage, including ground, and it’s not always enough. A sudden change in power consumption can raise the level of ground just as much as it could lower the level of a power rail and you might not even notice, depending on where you connected your probe. See IIgs technical note #68 under “ground noise” (even though it’s a GS tech note, it’s not a GS-specific problem). It looks like the maximum size of the configuration data for this FPGA is about 40K, so it will fit into the memory of the Apple II. I would recommend using the Apple\’s GPIO port, I mean game port, to program the FPGA via SPI. You\’ll need a dip cable (digikey has these) and potentially another level shifter, but should still be less than a jtag programmer. If I\’m dumb and for some reason the configuration data is bigger than I thought, according to the datasheet you can even reprogram the device while it\’s in use, so assuming it is working at all, you could conceivably have up to 800k of configuration data for it. All this said, while it\’s obviously far more awesome to update the FPGA via the Apple if you can, a JTAG programmer only costs $20 on fleabay, and a bus pirate is only a little more. So there\’s no shame in asking your users to get one if that\’s what has to happen. I prefer the JTAG approach to upgrading the firmware. I’ll go even one step further by suggesting a pogo stick pin approach to updating the firmware. Many projects now use this approach to update firmware. All you need to do is develop the adapter for those who want to update the firmware. Making the JTAG pads on the board costs zero. Wouldn’t that design be a great base to do some kind of lower cost “carte blanche” ? With an fpga solution like yours wouldn’t it be possible to reprogram the card to act like say a super serial ? Or a super super serial to allow greater speed and eventually allow DMA transfers ? An idea for the firmware update from the A2. Without having any other solid state disk products: ADTPro’s virtual drive support. 800k floppy support, but it’s actually a file on a modern computer hooked up as the ADTPro serial server. Yes, additional, maybe, hardware is needed, but it’s still vintage gear, and may already be present and not needed to be bought, the Super Serial Card. I’d say most eventually get the ADTPro route working in order to bring disk images to thier real A2 floppies. So for firmware flashing through this route would have an upper limit of 800k of virtual disk space to work with. Just a thought.